Silverine Bagged the award for Best Salon & Spa in North India. SILVERINE BAGGED COVETED AWARD FOR BEST BRIDAL MAKEUP AND SKIN CARE SALON OF RAJASTHAN 2018-19 AWARD. Another feather got added and made the the crown of Silverine more beautiful as they were conferred with the BEAUTY & WELLNESS AWARD 2018-19, Award marked their contribution to the beauty and wellness sector and came as a huge surprise to them as many spa, beauty and wellness professionals participated from nook and corner of India to represent their respective cities. 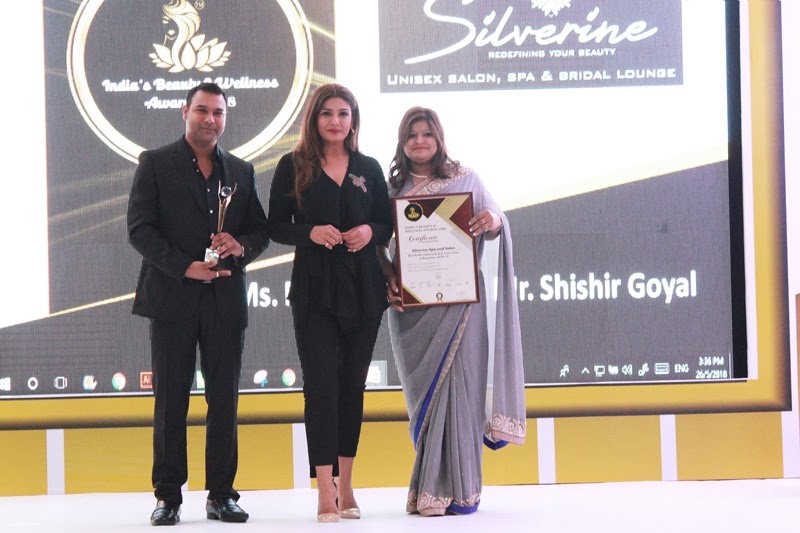 Silverine spa and salon represented pink city in the category of Best salon and spa in North India, It was a moment worth cherishing and rejoicing for us by receiving the award from the very charming and ravishing Bollywood actress Ravina Tandon who her self is the epitome of beauty and aesthetics" stated Shishir & Purnima Goyal, proud promoters of Silverine spa & salon. New chapter of glory has been added after getting the award Amidst the stalwarts of the beauty industry from different parts of India. Awards were organised by XCEL RESEARCH organisation in Leela Kempensky Hotel. Who's who of Delhi attended starry event and raised a toast to the success of winners.